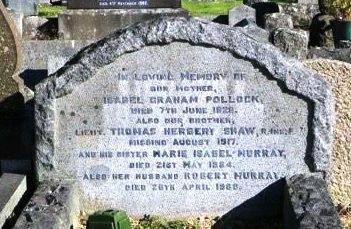 Thomas was the son of David, a "Soap and Candle Manufacturer", and Isabel Graham (née Cahoon) Shaw. He was born on the 28th February 1895 and registered in Strandtown, Belfast. In 1911 (Census of Ireland) Thomas was living at 81 Earlswood Road, Victoria, Co. Down, with his parents, older brothers, Jack Cahoon and James Alexander, younger brother, Frederick Cecil, and younger sister, Marie Isabel. The family also employed three 'Servants' - a Nurse, a Cook and a Housemaid. The family was also recorded as being "Presbyterian". Thomas was stated to be employed in the "Linen Trade". Thomas' father, David, died on 1 November 1913 and Thomas' Medal Index Card shows addresses for "Mrs Shaw" (his mother), recorded on the reverse, which were 'Sunnybank'. Strandtown, Belfast, and then 3 Lorelie, Bangor, Co. Down. Details of Probate granted at Belfast in 1919 to Isabel Graham Shaw, 'Sunnybank', Earlswood Road, Belfast, widow, showed total effects of £3978 7s 10d. [£3978.39] (This represents a relative value of about £169,100.00 today - 2014.) Thomas' mother clearly remained in Ireland until after Thomas' death, before remarrying and as Isabel Pollock lived at 56 Prince’s Square, Paddington, London. No obvious link can be found as to why Thomas should appear on the Buxton Memorial, unless his work brought him to the town. The 6th (Perthshire) Battalion of the Black Watch (Royal Highlanders were stationed in Perth at the outbreak of War, part of the Black Watch Brigade, unallocated to a Division. They moved to Queensferry on Forth Defences and then to Tay Defences in November 1914. On the 16th April 1915 the Battalion was posted to Bedford and attached to the 2nd Highland Brigade in Highland Division, and from there posted to France, landing at Boulogne on 2nd May 1915. Ten days later, on the 12th May, the formation became 153rd Brigade in 51st (Highland) Division and concentrated in the area of Lillers, Busnes and Robecq. During the remainder of 1915 the Division were engaged at The Battle of Festubert, where they were said (by the First Army commander, Sir Douglas Haig) to be still "practically untrained and very green in all field duties", and later at The Second Action of Givenchy. As stated above, in June 1916 Thomas was Commissioned 2/Lieutenant in the Royal Inniskilling Fusiliers. The 7th Battalion had landed in France in February 1916 as part of the 49th Brigade in 16th (Irish) Division. During the Battle of the Somme Thomas would have fought at The Battle of Guillemont, in which the Division captured the village, and The Battle of Ginchy, both in September 1916. In 1917 Thomas' Division were engaged in The Battle of Messines, in which, commencing at 3.10 a.m. on Thursday 7th June, 1917 the British Second Army under General Sir Herbert Plumer started an attack which in three hours resulted in the capture of the whole of the Messines Ridge on the South side of the Ypres Salient. The Book of "The Seventh Service Battalion, The Royal Inniskilling Fusiliers, from Tipperary to Ypres" has some references to Lieutenant Shaw: From page 55: "Captain C. H. Stainforth was given command of the raiding party, and the following officers and W. O. 's were detailed with him:- Lieutenant H. B. O. Mitchell, M. C., Second-Lieutenant J. Cunningham, Second-Lieutenant C. A. Crowe and Second-Lieutenant Shaw; C.S.M. McKeman and C.S.M. Knibbs. At 10pm the raiding party set out for their assembly position in the support line (between Vendin Alley and Broadway) fully equipped with knobkerries, bombs, and to complete their paraphernalia, their faces were blackened to avoid detection. The wind played false about an hour before zero hour, and the G.O.C. Brigade had to cancel the scheme." The above paragraph happened on the 26th June 1917 when the Battalion was in the Loos Salient. This would have been after the Gas attack at Hullage in April. The Battalion War Diary tells us that on the 1st August 1917 it had moved back to 'B' (Bivouac) Camp in the Brandhoek area, about ¾ mile [1200 m.] south-east of Vlamertinghe, because of very wet weather and lack of shelter. 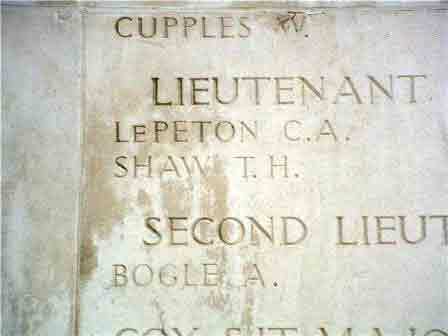 They stayed there until the 6th when 2nd Lieutenant T.E. Johnston, the Battalion Intelligence Officer went up to the front lines "… in the neighbourhood of the Ypres - Zonnebeke road." When Lt. Johnstone returned about midday he had been slightly wounded and gassed and was admitted to hospital. That evening [6th] the Battalion moved out, passing through Ypres about 10.00 p.m. and proceeded to the front line to relieve the 8th Battalion, Royal Inniskilling Fusiliers. The Battalion's new trench position, according to the War Diary was: "… running roughly through Frost House, i.e. about 400 yards [366 m.] N.N.W. of Frezenberg - Low Farm - and thence to Steinbeek at a point about 150 yards [137 m.] of the southern limits of the old German strongpoint, know as Pommern Castle. ….. The Bn H.Q.s were at Square Farm, just over 500 yards [457 m.] from the crossroads at Frezenberg." The War Diary described the ground the Battalion was covering as "… remarkably open and free from natural obstructions, hedges, trees, etc." All four of the Battalion's Companies were in the front line at this time, but the CWGC records only one man of the 7th Battalion, 18 year old Pt. Thomas William Read, being killed in action. The Battalion was now located at Square Farm and at 8.55 p.m. the following day (7th August) there was "Intense artillery fire by Germans all along the British front. …. Our casualties 8 O.R.s wounded, these slight casualties being due to the enemy not having got our front line range accurately. One M/G at H.Q. 's was destroyed and two temporarily put out of action. …… The situation became normal again about 9.45 p.m."
Also, from page 113 of "The Seventh Service Battalion, The Royal Inniskilling Fusiliers, from Tipperary to Ypres": "Lieutenant T. H. Shaw and Sergeant Carroll were reported missing the next morning. At the time it was assumed they had lost their bearings in the dark and walked into the German lines by accident: this theory was evidently incorrect, as they were never heard of again." The War Diary gives the following information on how he lost his life: "2nd Lieut. & A/Lieut. T.H. Shaw and Sgt. Carroll, both of 'B' Coy, during this bombardment [as described above which accounted for John Drabble's death] in moving forward to their front line of shell holes and old trenches (German) presumably lost their bearings and wandered into the German lines, where presumably they were captured." Sadly, this was not the case; both Lieutenant Shaw and Pt. Samuel Carroll were killed that day. In total 5 men from 7th where killed on the 8th of August, they are now commemorated together on The Menin Gate Memorial to the Missing. 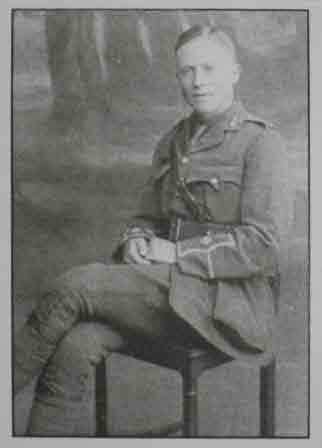 Private 30302 John Drabble, of the same Battalion, also a Buxton man, was killed in action on the same day. One can only assume he was killed in the artillery bombardment described in the War Diary. · I am also grateful to 'sotonmate', via the Great War Forum, for the extracts from the Battalion War Diary. 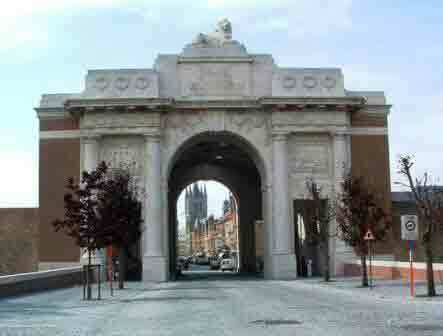 · "The Seventh Service Battalion, The Royal Inniskilling Fusiliers, from Tipperary to Ypres"